From order to installation, we’re here to take care of every detail. Our trained staff will come to your home or apartment to measure your garage or car space, obligation free! 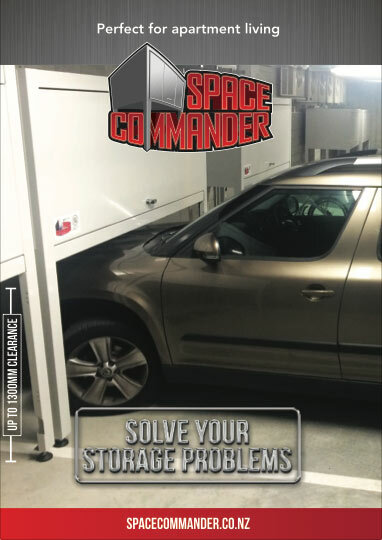 To buy the Space Commander™ Over Bonnet or Double Decker systems just contact us on email: sales@spacecommander.co.nz or call us on 0800 952 952 to arrange for an obligation free measure of your car space. You can also email or call if you would like to discuss The Bikebox™ or Patio Box, or you can order directly from EzyNeezy Online and have it shipped for free. PLEASE NOTE: Space Commander™ products require specialist installers and therefore we are not able to offer a supply only or “do-it-yourself” price. No two car spaces are the same. Often there are obstacles and services that need to be taken into account when determining the correct Space Commander™ model for your car space. If you think you need strata approval prior to installing your storage unit just let us know and we can provide you with an Application Letter that outlines all of the relevant product information for your Building Manager or Owners Corporation. Our pricing is inclusive of GST, delivery and installation. It is not listed on our website as the pricing differs by city and region based on freight and delivery costs. This ensures they arrive in perfect condition, and makes for a stronger, more secure and more rigid structure than being pre-assembled.